I'm the King of the silent pictures -- I'm hidin' out 'til talkies blow over . . . 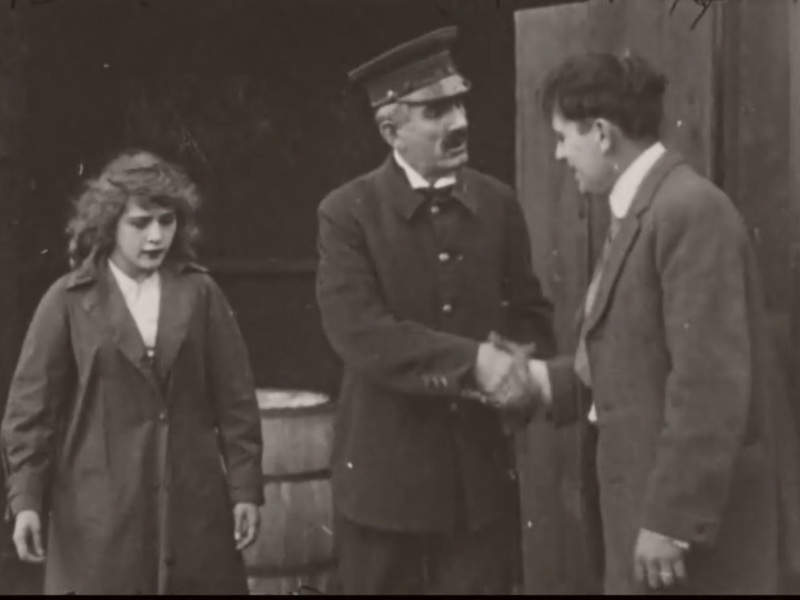 Abducted and held hostage by an escaped convict disguised as a prison guard, Edith (Mary Pickford) helps her “coward” boyfriend (Edwin August) pass a true test of courage under duress in A Beast at Bay (Biograph, 1912, directed by D.W. Griffith). One of the charms of the single reel drama — a complete story arc in less than fifteen minutes — was also one of the biggest challenges for early filmmakers. The format is inherently limiting. There is little or no room for a backstory, or digression. Once the primary characters are introduced, their basic nature and motivation must be established promptly. The dramatic evolution of a main character might be delayed until the climactic moments of the story. Despite the limitations of the format, those who mastered it were able to effectively deliver as much dramatic interest as might be seen in a modern, hour-long television production. And they did it without relying on dialog intertitles, which were uncommon during the peak years of the single reel drama — roughly 1908 to 1913 — before features became the dominant format. In A Beast at Bay, we have four “acts” in miniature. We get the characters and a sample of their personalities in the first three scenes, only one of which lasts more than 60 seconds, constituting a “first act.” The second act provides the spur to action — an abduction. The third, a high-speed pursuit. And in the fourth, a clash of opposing forces ending well for two of the three principal players. We even get a tender epilogue. For Mary Pickford, 1912 marked a return to her cinema roots. 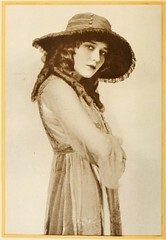 She had departed Biograph at the end of 1910 and joined Carl Laemmle’s Independent Motion Pictures (IMP) company. She gained the star publicity denied her at Biograph, but coupled with a star-crossed marriage to Owen Moore, it turned out to be the lowest point of her film career. The contract with IMP was nullified in court after less than a year — Pickford had signed it while still a minor — and after a brief, unpleasant and ultimately unsuccessful stint with the Majestic company, she returned to her first film family at Biograph. A Beast at Bay was another sort of return-to-roots for Pickford. 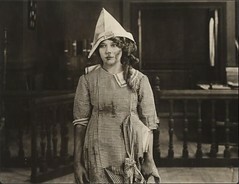 One of her first screen appearances had been The Lonely Villa (June, 1909), a suspense film propelled by a fast and furious ride-to-the-rescue sequence. 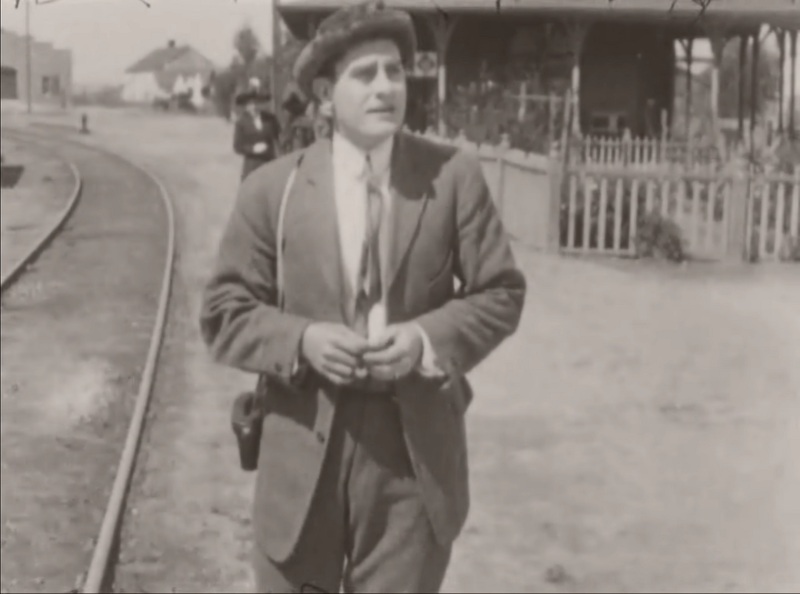 Although “Beast” featured tracking shots of a car and a roaring locomotive, it wasn’t exactly revolutionary even for Biograph– Griffith and Bitzer had filmed a race on the rails in The Girl and Her Trust just weeks earlier. 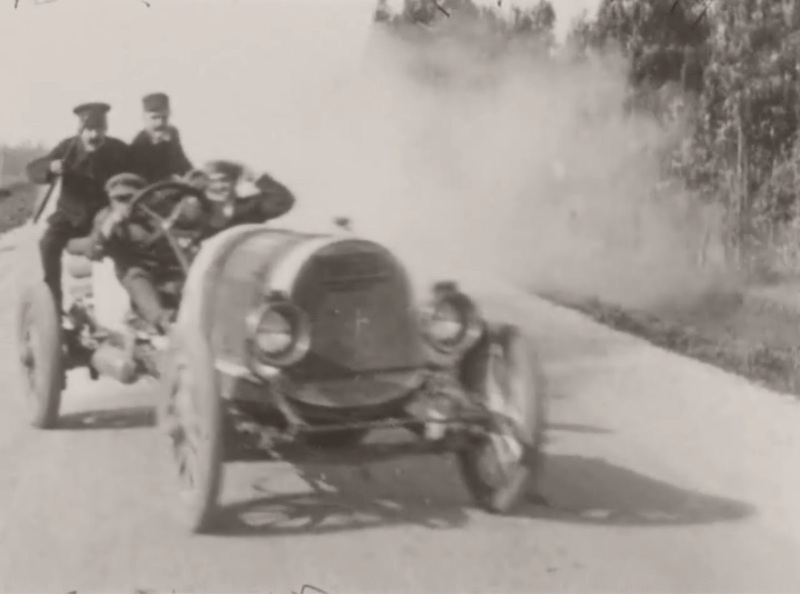 What may have been intended as a difference-maker in A Beast at Bay was the addition of a third element to the chase — a racing car commandeered by the lawmen to aid them in pursuit of Pickford and her abductor. (Automotive racing had recently become a “thing” in the States — the inaugural Indy 500 race was held a year earlier). However, this proves to be superfluous to the main action, adding little more than a nice shot of the racer briefly becoming airborne over a hump in the road (though predating the famous shots in 1968’s Bullitt by more than a half century). A Beast at Bay was shot on location during the Biograph company’s third annual winter excursion to Southern California. Completed in March (the exact dates and specific locations are not recorded), the film was released the 27th of May, 1912, at a length of 998 feet (304 meters), a single full reel. Of course the quality pales in comparison to a transfer made from the original camera negatives or early generation source material. 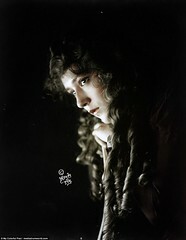 The gorgeous video clips at the Mary Pickford Foundation website give us a brief but revealing look at what could be. A Beast at Bay contains 95 shots or “cuts,” plus 10 intertitles. Though not all of the shots are represented here by an image, all of the intertitles are reproduced in text at the appropriate points, in all-capitals within quotation marks. 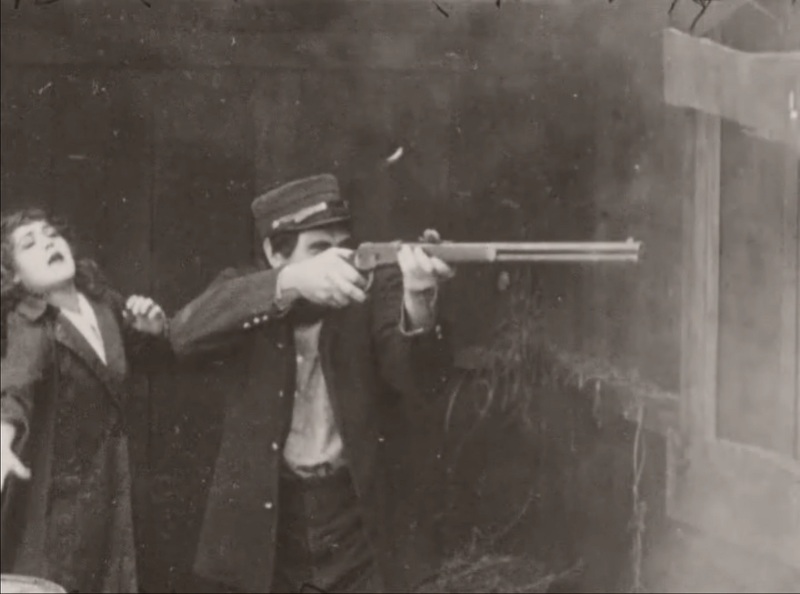 The intertitles do not give proper names for any of the characters, simply referring to them as “the girl,” “her ideal” or “the convict.” The Biograph Bulletin plot synopsis, also reproduced in excerpts and quoted in italic within brackets [“…”], refers to the couple as “Edith” and “Jack.” For the sake of clarity so will I. A Beast at Bay opens not with an introductory intertitle, but with a moody shot of an escaped convict (Alfred Paget). He emerges slowly, carefully, from the dense vegetation and scans the area for signs of his pursuers, a troop of well-armed prison guards intent on his capture. A blunt intertitle precedes our introduction to a beaming Edith (Mary Pickford), eyes caressing “her ideal” man, Jack (Edwin August). She confides in a friend (Mae Marsh) her attraction to Jack as the two gaze upon the object of Edith’s desire. We don’t know the exact nature or length of their relationship (unless we’ve cheated and read the Biograph Bulletin). Edith leaves the side of her friend and walks quietly, unseen, to Jack who is packing his golf clubs (or is he an angler packing his rods?) in final preparation for an out-of-town trip. Jack turns to pick up his travel trunk and sees Edith. Both smile broadly. As Jack lifts the heavy trunk, Edith places her hand on his and they carry the trunk together, walking toward Edith’s car. That’s correct. It is 1912, and Edith owns and drives, quite skillfully, a large, five-seat touring car, a beastly machine. And Edith is driving Jack to the train station. As they reach the car, a belligerent drunk approaches and begins to gesture rudely, mockingly, toward Jack. (He seems to be especially offended by Jack’s appearance, one of wealth and sartorial good taste). Jack tries to ignore him, keeping his back to the man, but he is clearly uncomfortable. The drunk becomes more abusive, and appears to challenge Jack to step into the street and take him on. Jack remains impassive, but his face betrays a growing embarrassment and humiliation. As a final act of aggression, the man kicks the tire of Edith’s car. Seeing no response from Jack (or, just as likely, needing another drink), he hurls a few final insults, then turns away and stumbles back into the street. When Edith seeks an explanation for his inaction, Jack makes a feeble effort to defend himself. He wags his thumb over his shoulder dismissively, implying that the matter wasn’t worth escalating to the point of physical confrontation with a drunken bum. Edith briefly but pointedly makes her disappointment known, then walks to the car. She turns the crank, hops into the driver’s seat, releases the brake, puts the beast in gear, and they’re off to the train station. 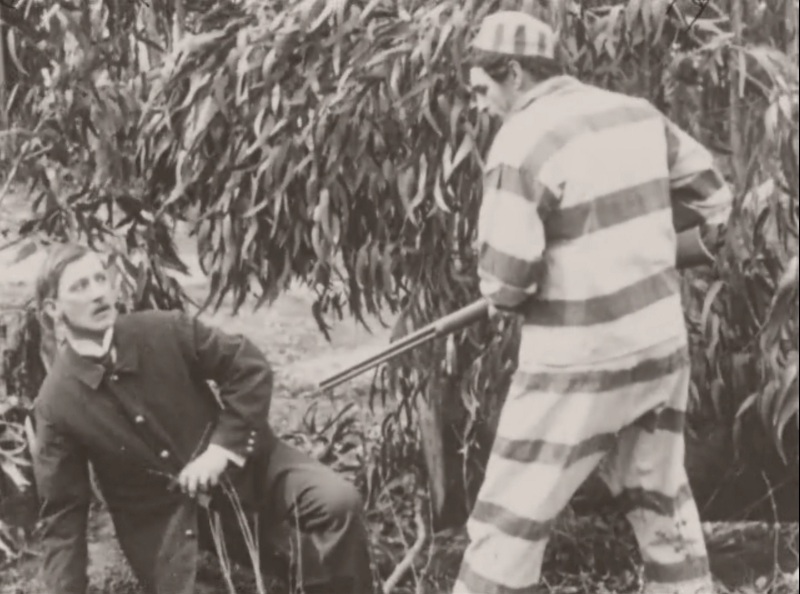 The convict has captured the captain of the guards, forcing him at gunpoint to exchange clothing. As they pull into the train station, Edith is still brooding over the incident. 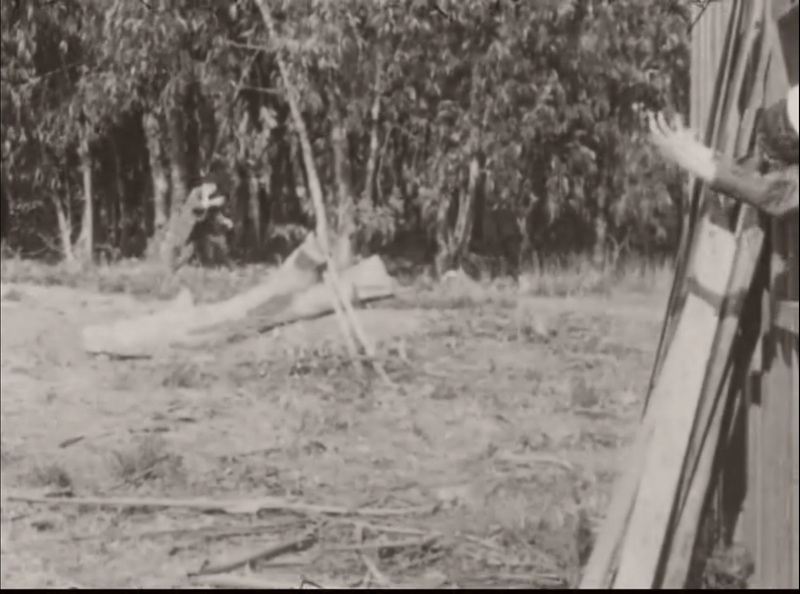 In the clip below, she can be seen clearly saying the words, “Coward,” and “Goodbye” to Jack. From the train station, Jack observes Edith’s vehicle departing. Then, in a series of 11 shots (excluding the intertitle) alternating between Jack at the station and Edith’s car, we witness the abduction from what is intended to be Jack’s point of view. 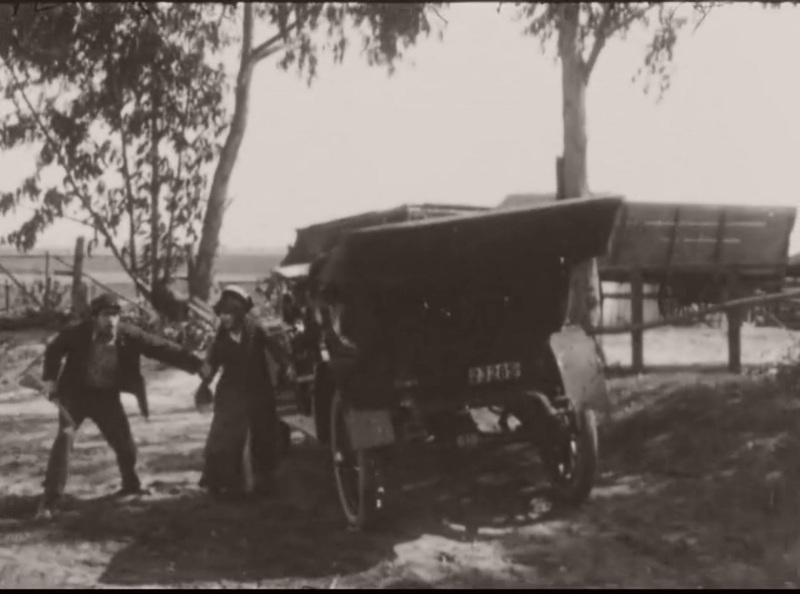 The first two shots of the sequence show Edith and the convict at the rear of her car, matching the direction in which the car had traveled, i. e., away from Jack and the train station. But when Edith and the convict get into her car, Jack uses binoculars to get a better view. Aided by the binoculars, Jack’s POV does the impossible: it shifts to a view of the front of the car. The car hasn’t moved and neither has Jack, yet his point of view has. 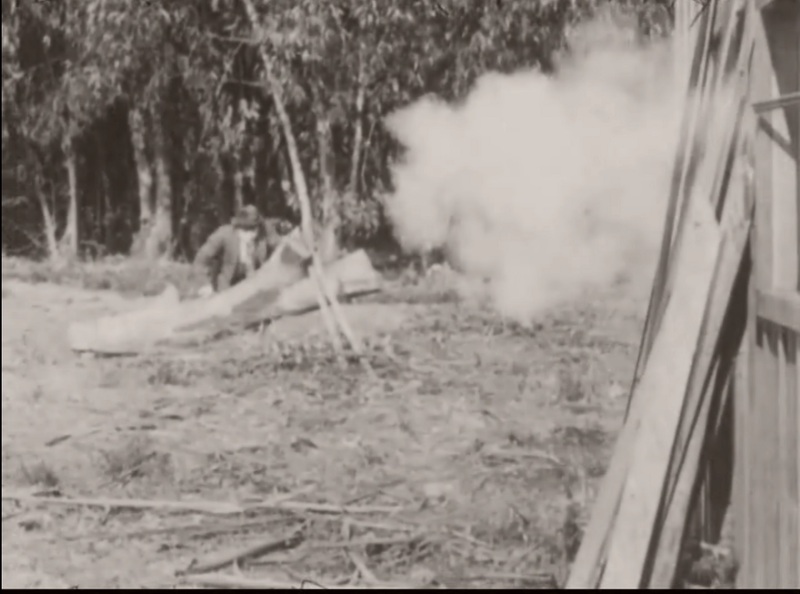 Something we take for granted, the matching of cuts in a point-of-view sequence, has yet to be made standard in 1912 (at least for Griffith and Biograph). 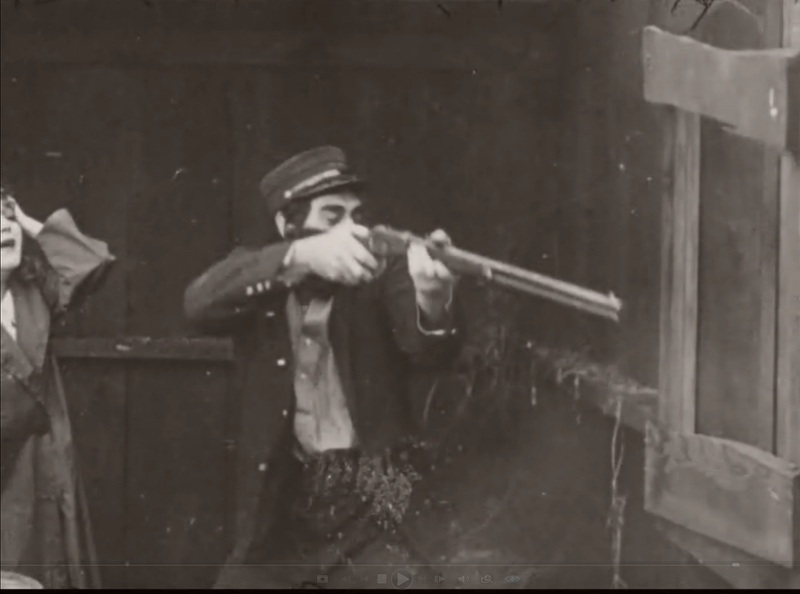 As the lawmen arrive on the scene and inform Jack that Edith’s abductor is an escaped convict in police uniform, the captain uses Jack’s binoculars with the same mismatched results. 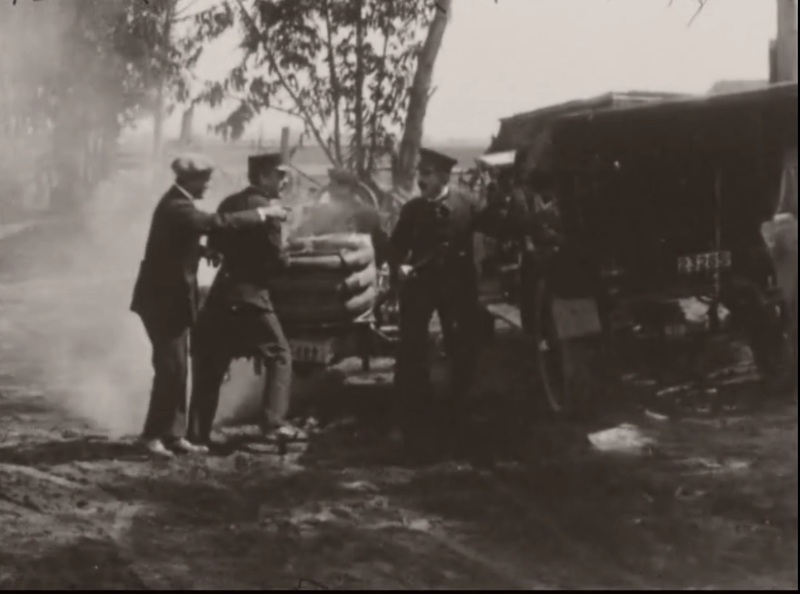 As Jack and the lawmen observe the car pulling back onto the road — the POV shifts once more, to the rear of the car as it pulls away. The situation is dire: neither the lawmen nor Jack have access to a car, and every minute that passes is another mile lost. Their only hope of catching the car is to commandeer a train engine to follow along the tracks that run parallel to the roadway. 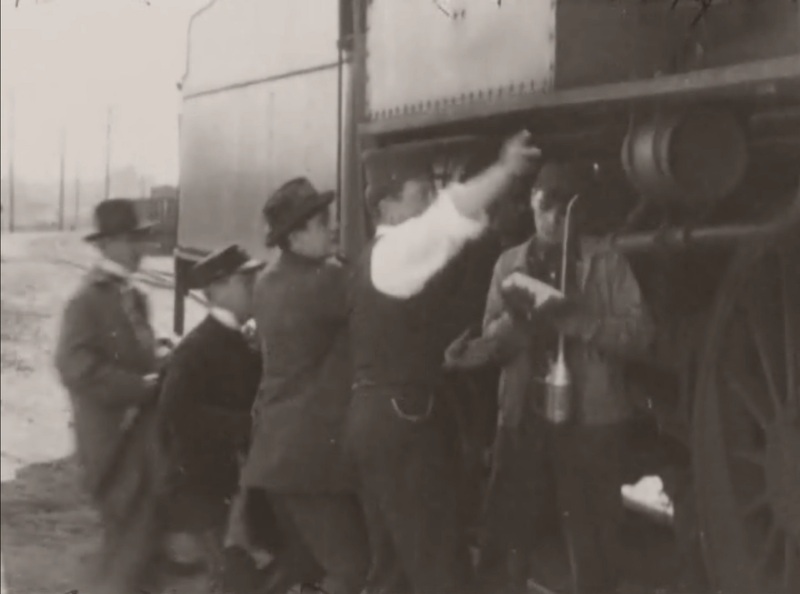 When they are rebuffed by the locomotive’s engineer, they prevail upon the train dispatcher to reassign the engine for police work. 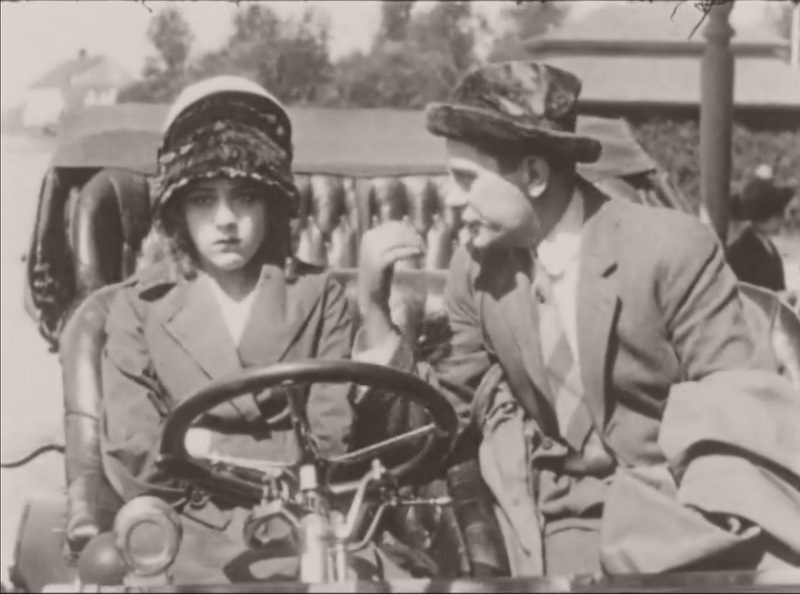 Edith tries to take advantage of her abductor’s ignorance of the horseless carriage — she slows and stops the car, pretending it has broken down. He calls her bluff by wrapping his hands around her neck and squeezing. She gets the message and, miraculously, the car is just fine and back on the road. But now . . . they are being pursued. 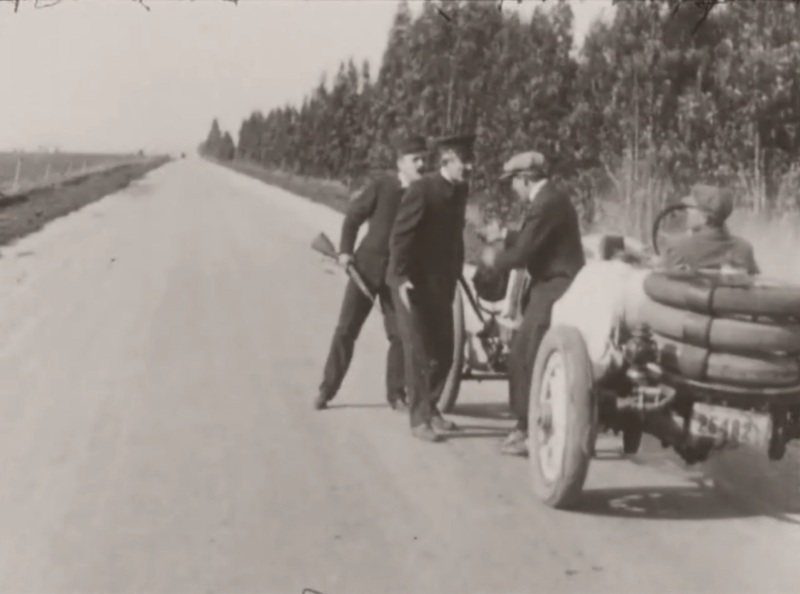 Two of the guards stop a racing car whose occupants tell them that they have seen two people in a car matching the description given by the guards, traveling in the opposite direction. The guards enlist the civilians to drive the racer in the pursuit. 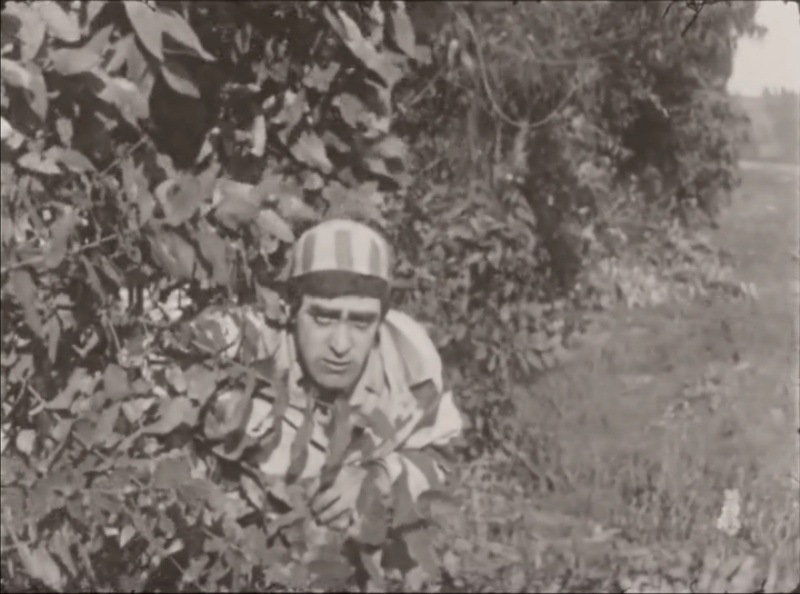 The convict decides to abandon the car, apparently to distract the attention of his pursuers, throwing them off the trail and perhaps buying a little more time while he heads in another direction: into the woods, taking Edith as hostage. But still pursued by Jack and the guards, now on foot . . .
. . . and by more guards in the racer. The convict finds cover and a place to make his stand with a human shield, Edith. 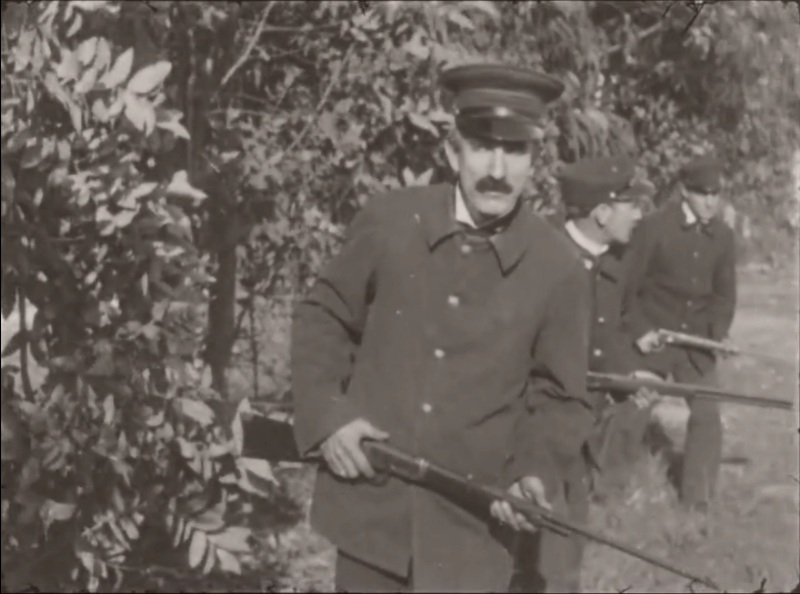 Having found the abandoned car, Jack and the guards split up to search the woods . Edith is trapped and at the mercy of this leering psychopath. He clearly enjoys being in a position of power over her — his words show that he appreciates the delicious irony of the situation. He is mocking her and her wealth that buys beautiful clothes and hairstyles while he has worn prisoners’ stripes. He mocks her as the drunken tramp mocked Jack for his trappings of wealth. But unlike the tramp, he is not a pathetic, stumbling, mumbling drunk — he’s psychotic and he has a gun. He won’t tire of the game and simply go away. Edith can’t turn her back and pretend he doesn’t exist. He holds the power of life and death over her. The scene begins with a medium-close shot (i. e., from the knees to head), probably dictated by the close quarters of the shack. (Was it shot on a set in LA , or on location? There is no record.) Now fixated on Edith, the convict seems to have forgotten his pursuers. He backs Edith against a wall, touches her hair and lifts the hem of her coat to see what is underneath. The tension escalates then reaches a climax with an abrupt cut in mid-scene to a shoulders-to-head closeup of the convict in a terrifying, psychotic meltdown. Edith’s screams in reaction are heard far outside the tiny shack. 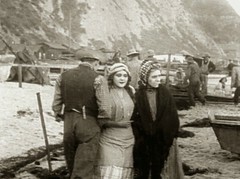 It is one of the rare uses of a closeup for purely dramatic purposes in the Griffith-directed Biographs, considering the credit he was once given for the invention and/or integration of the shot as a standard cinematic device. Regardless, it works. The moment gives us a significant jolt. 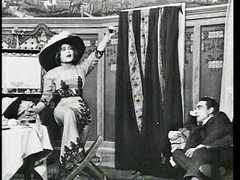 Jack cries out in response to Edith’s screams, rousing the convict from his fixation with Edith. His prisoners’ instinct for survival kicks in and Jack now becomes target practice for the con and his confiscated carbine. 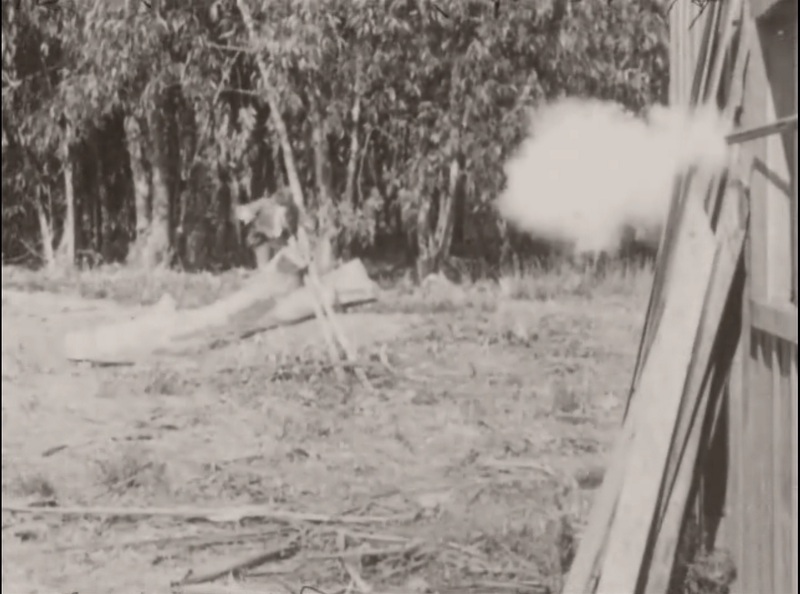 Jack summons all of his unspent courage and begins to crawl forward like a besieged infantryman emerging from a trench, taking deadly fire head-on but determined to reach his objective. Beginning with the last shot prior to the intertitle (which I’ve removed in order to concentrate on the shots), we are given a series of cuts alternating between the interior of the shack with Edith and the convict, and the exterior with Jack. But in the construction and editing of this sequence, modern conventions of film “grammar” for alternating POV shots or “reverse angle” shots — requiring the matching of sight lines or “eye-lines” — aren’t followed here, at least not consistently. Though the effect is not as bizarre as the earlier POV shots at the train station, it renders this sequence slightly confusing or disorienting to the modern viewer. Below, the first pair of shots basically follows “modern” convention, as the line of sight between the Edith and Jack matches, more or less. It’s not perfect (Jack is looking upward while Edith looks straight ahead), but it still works. In the next pair, below, the first shot is is practically unchanged. But the second shot shows Edith’s arms at right beckoning out the window toward Jack at left. Jack is now looking to our right toward Edith and the shack instead of looking to our left as he was in the first pair of shots. That violates the sight-line established in the first shots of both pairs, where Edith is looking to the right of the frame. Our brains have to pause for a millisecond to figure out exactly how these images relate to each other. It’s just long enough to cause confusion as we try to keep track of the sequence of events. In the next pair, immediately above, the second shot again is non-matching. 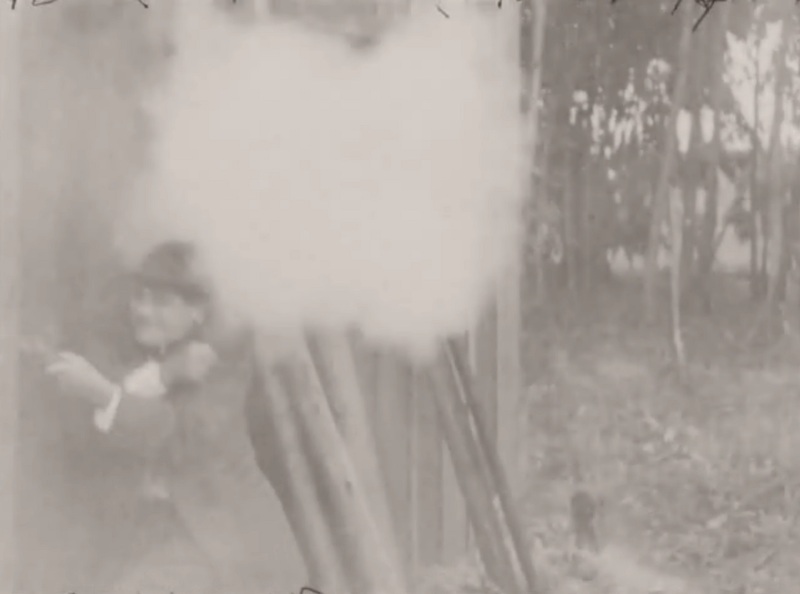 The only difference is that instead of Edith’s arms, we see the barrel of the carbine as the convict fires at Jack, who is still looking right from the left of frame. And immediately below, the mismatch is repeated . . .
. . . until, immediately above, Jack reaches the shack, shown in the second shot from a new angle. The sight-lines now match, and Jack, through a thick haze of gun-smoke, is about to enter the door and meet his opponent face to face. 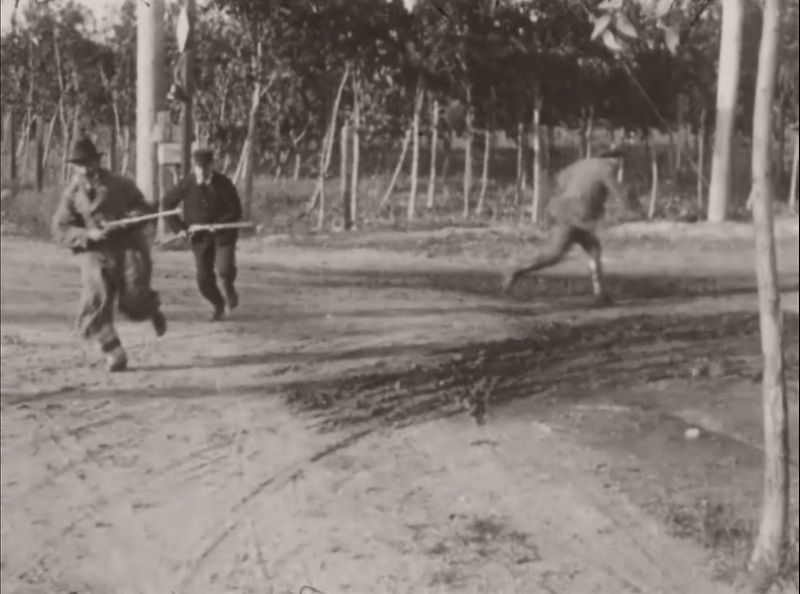 The racers and the remainder of the guards arrive at the site of Edith’s abandoned vehicle. 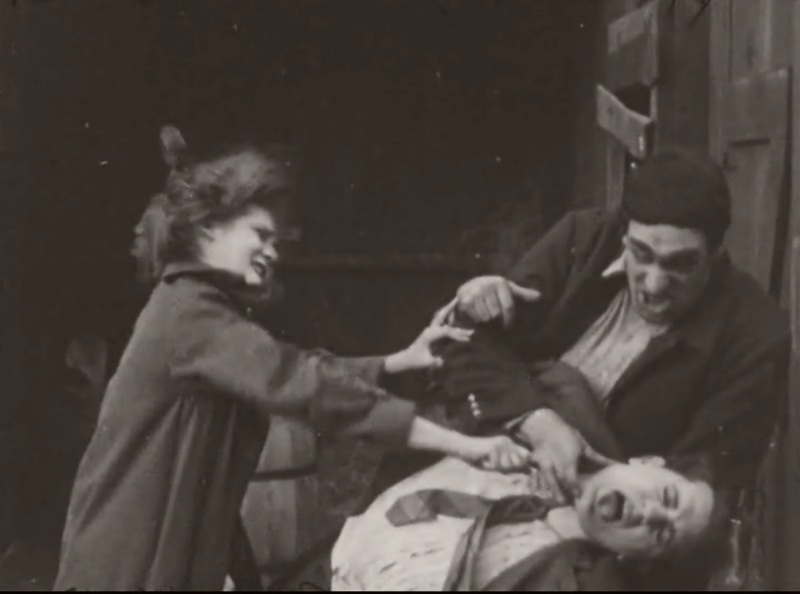 But the struggle is not going well for Jack and Edith, as the convict tosses Jack around like a rag doll . . .
. . . until, in the nick of time, the guards reach the shack . . .
. . . and disarm and subdue the convict. Jack and Edith, though worse for wear, are fine . . . and relieved. The guard captain thanks Jack for his bravery . . . and Edith apologizes for ever doubting his courage. 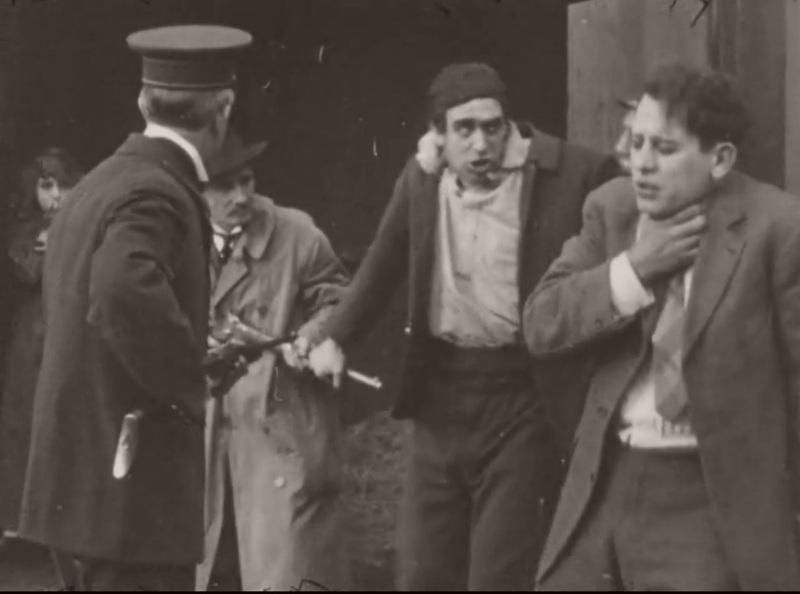 The Biographs in the Griffith/Bitzer era (1908-1913) were filmed at a variety of speeds, some well below the 16 frames per second that became a de facto industry standard by the end of that period. 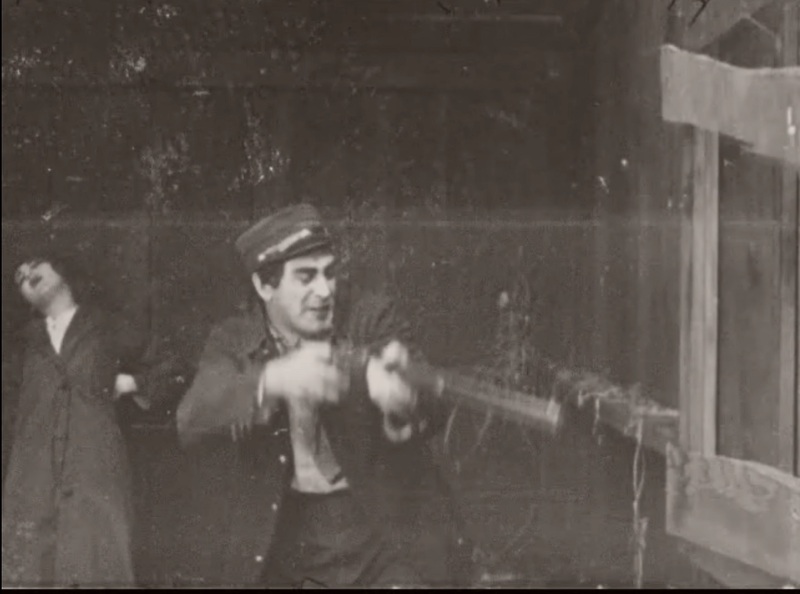 Even within films, Bitzer (and maybe Arthur Marvin too) cranked or “under-cranked” his Biograph camera at various speeds — 16 fps for some scenes, 14 or 12 for others. This digital transfer of the film runs a whopping 17:53, including 14 seconds for the LOC intro/outro voice-over. 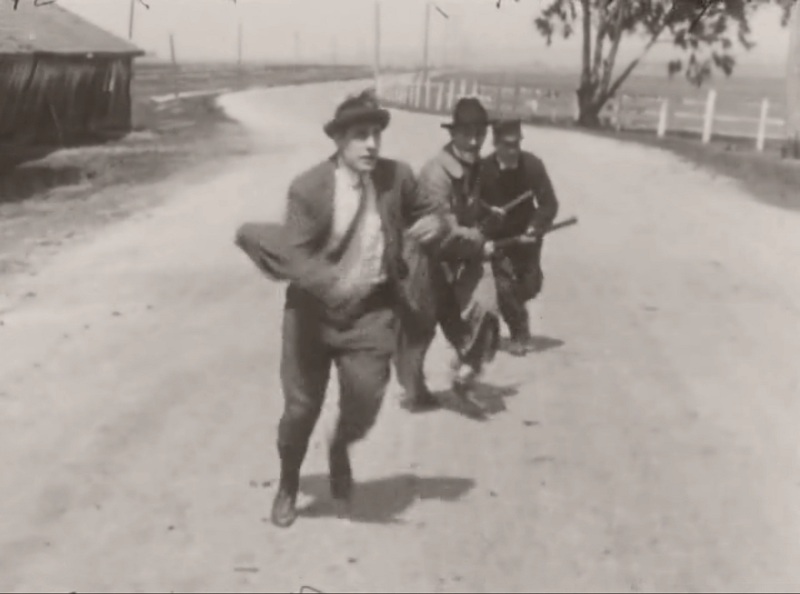 At this speed the film seems to drag, most notably during what should be the highlight of the film, the chase sequence. I don’t know if this was an artifact of the duplication of the paper prints to 16 mm film in the 1960s, or if it was a choice made in the digital transfer. But a run time of nearly 18 minutes is too slow for this single reel “suspense” film. Calculated using the standard film speed formula, 998 feet of 35 mm film projected at the “silent standard” of 16 fps will result in a run time of just under 17 minutes. So, from a purely technical standpoint, a run time between 17 and 18 minutes is not far from “correct.” However, my personal taste, especially for the “action” sequences, is about 20% faster. The video clips used to illustrate this article are presented at speeds that simulate film projection at a range of about 18 to 20 frames per second, closer to, but still well under modern “sound speed.” Although I did this only for select scenes, I find the entire film plays better at around 13 to 14 minutes. 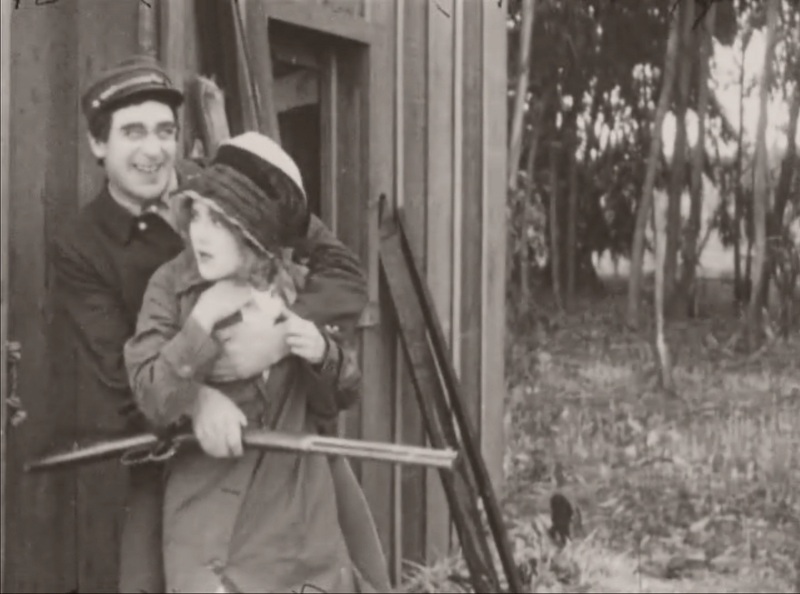 And if you are curious, the clip of A Beast at Bay at the Mary Pickford Foundation website — an excerpt that begins with Edith parking her car at the side of the road just prior to her abduction and ends with the hug near the end of the film — runs just over eight minutes (8:09). That same sequence in the LOC website source runs eleven and one-half minutes (11:30). I did not do a frame by frame comparison, but the difference between these excerpts when extrapolated for the entire film produces a run time of just over twelve and a half minutes (12:31) for the MPF source (compared to 17:39 for the LOC source without the LOC logo intro/outro). That may be slightly fast, but it’s much closer to my concept of a reasonable run time for this film. A Beast at Bay exists in primary sources at the archives of several institutions. 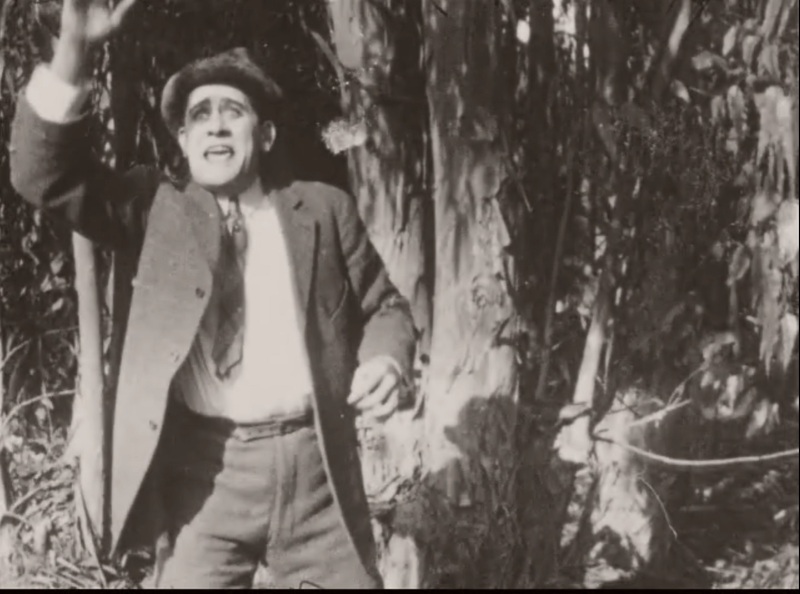 In the archives of the Library of Congress alone, the survey by Christel Schmidt tallies eleven primary source film elements for A Beast at Bay, with variations in length, format, and condition. Another large collection of primary sources for A Beast at Bay appears to be the British Film Institute National Film and Television Archive, with six 35 mm film elements, including four duplicate negatives and two access copies listed on the BFI website. Four of the six range in length from 926 to 964 feet. Also, it should be noted that the Schmidt survey of BFI holdings lists five additional sources at that institution, including four nitrate master positives (two of which are “badly decomposed”), and an additional access copy. The entry for A Beast at Bay in “The Griffith Project, Vol. 6” (BFI, 2002), also lists a “35 mm nitrate positive (printed 1920),” at the BFI, but as of February 2019, the BFI website does not list this item in their collection. However, it may be one of those four nitrate positives that Schmidt cited. “The Griffith Project, Vol. 6” reports a “28 mm diacetate positive” at The Museum of Modern Art in New York, and “two 16 mm acetate positives of undetermined generation” at the National Archives of Canada . The Mary Pickford Foundation Collection at the UCLA Film & Television Archive lists (as of 2013) a 16 mm safety print of A Beast at Bay. 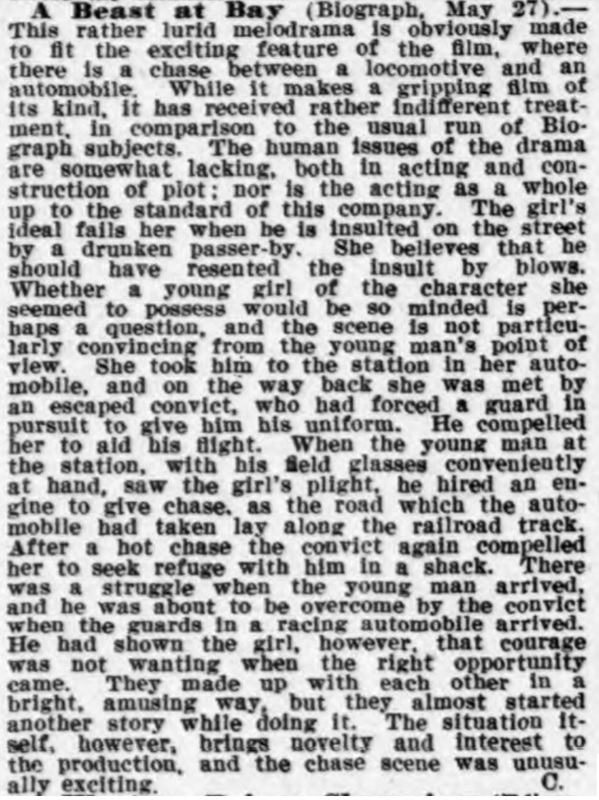 Review of A Beast at Bay, The New York Dramatic Mirror, June 5, 1912.
Review of A Beast at Bay, The Moving Picture World, June 8, 1912. 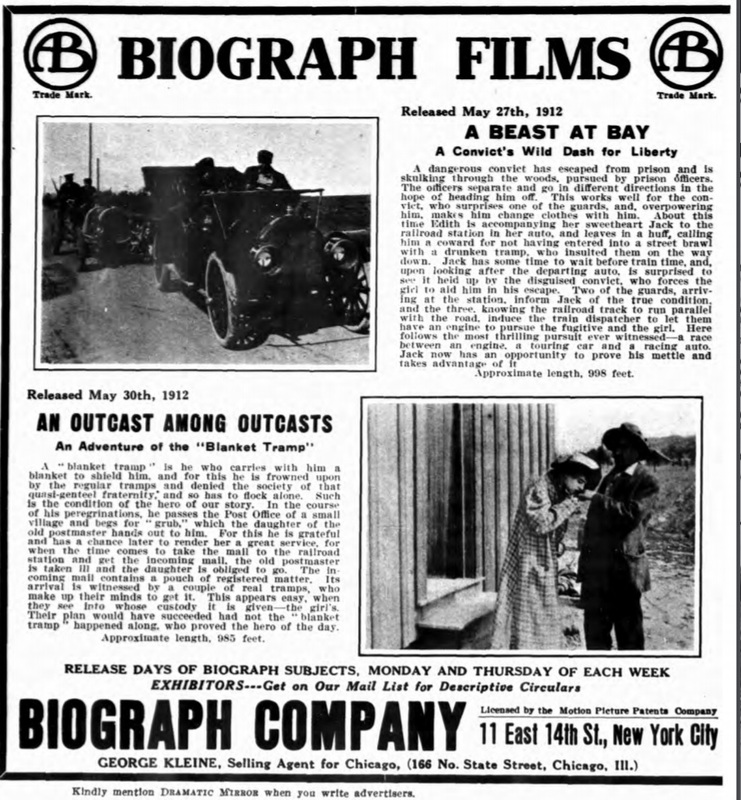 Note that the Biograph advertisement for A Beast at Bay characterizes the story as “A Convict’s Wild Dash for Liberty,” a more accurate a description than the title. This particular “beast” was never really held “at bay” until handcuffed at the film’s end. Biograph Company Ad, The New York Dramatic Mirror, May 29, 1912. The Mary Pickford Foundation for the eight minute excerpt from A Beast at Bay. New York NY Dramatic Mirror, 1911 Sep – Dec 1912 (Archives of The New York Dramatic Mirror at fultonhistory.com), for The New York Dramatic Mirror: Review, A Beast at Bay, June 5, 1912, p. 28, and Biograph advertisement, June 3, 1912.
Cooper C. Graham, Stephen Higgins, Elaine Mancini, Joáo Luiz Vieira, “D. W. Griffith and the Biograph Company (Filmmakers, No. 10),” (The Scarecrow Press, 1985), “A BEAST AT BAY,” p. 144, for cast and credits.